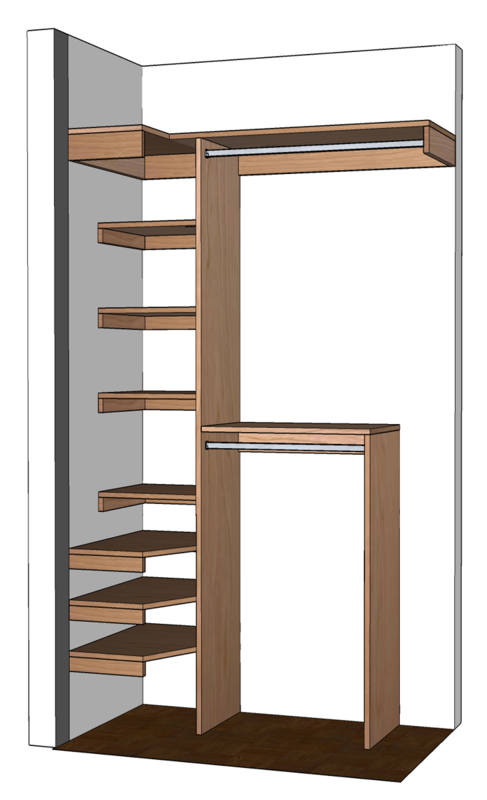 Free woodworking plans for a DIY small closet organizer for closets 3-5' wide. If you're stuck with a small closet there's not much you can do other than make more efficient use of the space. This small closet organizer does just that. It increases the closet rod by 20% and more than quadruples the amount of shelf space compared to an original design of a single shelf and rod. Lack of shelf space tends to be the reason closets get so cluttered in the first place. We tend to use closets for more than just clothes. Anything that we don't want to throw away yet don't want out in the open gets thrown in the closet where it tends to get forgotten. If you haven't seen your closet floor in ages because it's pilled high with bags, boxes and shoes, that's a clear indication you lack enough shelf area in your closet. 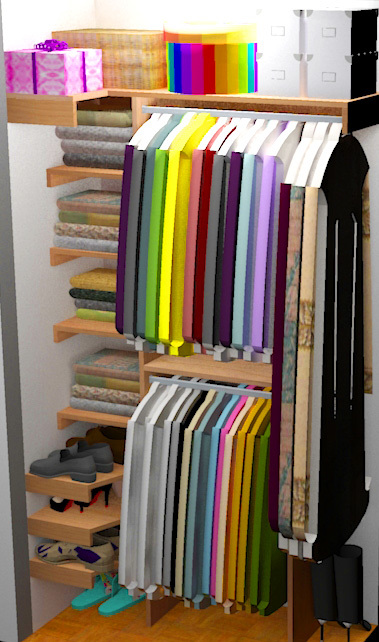 This closet organizer design aims to fix that problem. Use these plans as a guide and customize them to your needs. The plans should work well for reach in closets between 3' to 5' wide and 24" deep. 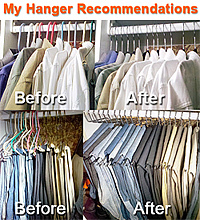 If your closet is larger, see my http://littlebitjohnny.blogspot.com /2013/01/closet-organizer-plans-for-5-to-8-closet.html" target="">Closet Organizer Plan for 5' - 8' closets. 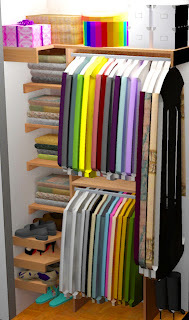 If this seems like too much work check out my http://littlebitjohnny.blogspot.com /2013/02/easy-small-closet-organizer-plans.html" target="">Easy Small Closet Organizer Plans. In this example we're using a 48" wide by 24" deep reach-in closet that has an 11" space between the left side wall and the door trim. Make any necessary adjustments to suit your closet. 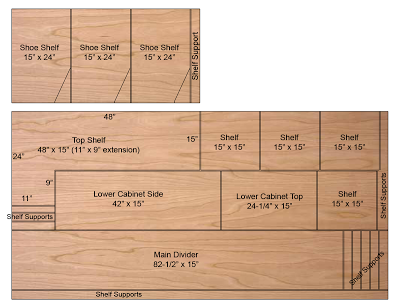 Here is the floor plan of the closet we'll be working in. If you're closet doesn't have much space between the sidewall and the door trim you won't be able to include the extended lower shoe shelves. 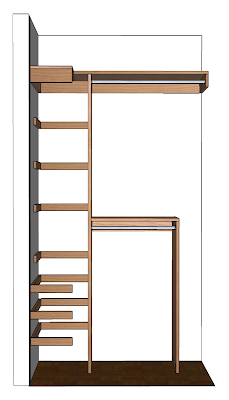 You can still include the shoe shelves but they will only be 15" deep like the other shelves. The size of your closet will most likely be different so double check the cut plan after you make the necessary adjustments to the component dimensions. 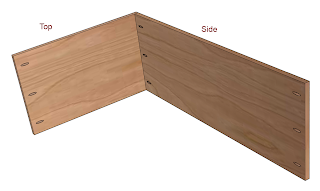 The main parts of the closet organizer are cut from 3/4" hardwood veneer plywood. Two sheets where used for this plan, 1 full 4' x 8' sheet and one 2' x 4' quarter sheet. 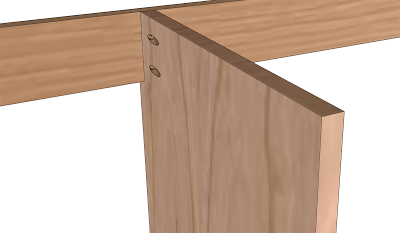 Some of the cutoffs can be used for the 2" shelf supports but you might find it easier to use 1x2 or 1x3 boards that match the species of plywood you selected instead. It will save time in making all those little cuts and edgebanding. The 1x4 boards are used for the top support as well as the lower support. The species of wood should match the plywood you selected and be finished the same way. You'll need 2 8' boards. Cut plan is not included because it will depend on your closet dimensions. 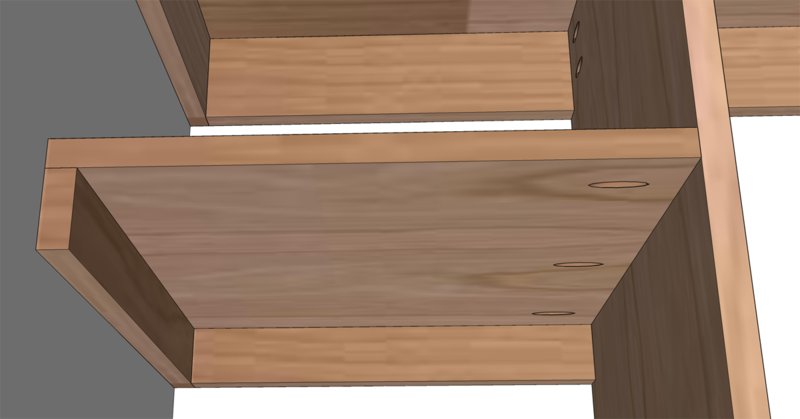 There isn't enough scrap on the plywood to create enough supports for the sweater and shoe shelves on the left of the organizer. You may want to forego the plywood supports and just use boards instead to minimize the cuts in plywood which can be time consuming if you don't have a table saw. Using boards also means you won't have to edgeband the supports that will be visible. If you're using boards for all the shelf supports you'll need 4 8' boards. It's best to cut out all the parts and finish them before installing the closet organizer. Make any adjustments necessary to suit your closet size, cut out the parts, apply edgebanding to the edges that will be visible, sand smooth with 80 then 120 grit sand paper, finally either prime and paint them or stain and seal them. Oil based paints and finishes are not a good idea for closets because they can out gas for a long time and make your clothes smell. Instead use low VOC water based paints or water based stain and a water based finish such as Minwax Water-Based Polycrylic. While your waiting for the closet organizer components to fully cure, get your closet ready for the new organizer. Empty out the closet and store your clothes in a safe place. Carefully remove the old closet shelf, rod and other boards that were a part of that configuration. Patch the walls with joint compound, sand and then prime and paint with a low VOC water based paint. 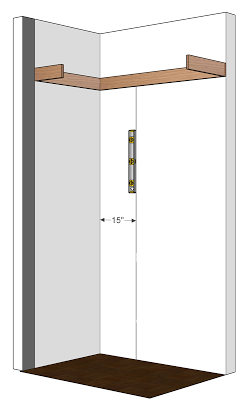 Use a level to find the highest point in the closet floor along the back wall. Houses can shift over time and the floors won't always be level. 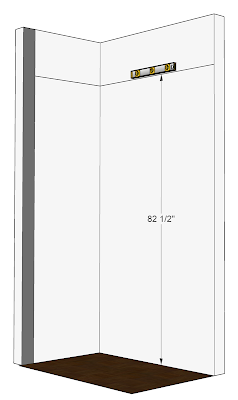 From the high point in the floor measure up 82-1/2" and draw a level line (in pencil) on the back wall, both side walls, and the front section where the shelves will be. Please note that to make it easy to show the installation, some of the walls are not visible. Measure and cut the 1x4 top support and screw it into the walls using 3-1/2" wood screws making sure to screw into the studs. The top of the board should align with the level line drawn in the previous step. Install the supports in the order shown. Starting with the return wall, next the left side wall, the right side wall and finally the back wall. Check your stud locations on the right wall and cut that support long enough to be screwed into at least 2 studs, one in the corner, one towards the end. Drive 2 screws at each stud location. Prepare the divider by cutting a notch at the top to fit around the top support 1x4 and at the bottom to fit around the baseboards. Drill 2 pocket holes at the top notch to be able to attach it to the top support. Align the left side of the Divider with the plumb line and drive 2 screws through the top pocket holes. At the bottom use an L bracket to attach the divider to the floor, making sure it stays plumb. 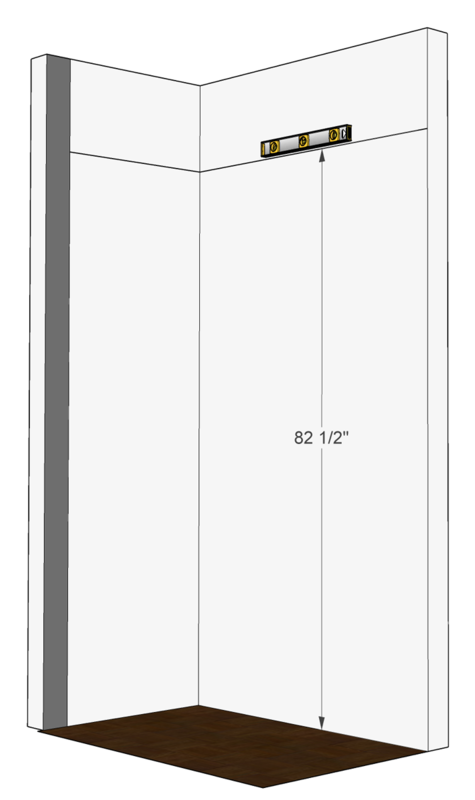 Draw a level line on the right side of the Divider, 42" up from the floor. Install the Lower Support 1x4 so the top is flush with the level line. Use 3-1/2" wood screws to secure the Lower Support into studs. Make sure that when you install the Lower Support you to not push the Main Divider out of plumb. Secure the main divider to the end of the lower support using 2 1-1/2" wood screws. Drill pilot holes before driving the screws to prevent splitting. The lower cabinet defines the bottom hanging area. It consists of the top and side and gets attached to the main divider. Begin by drilling the necessary pocket holes in both pieces. 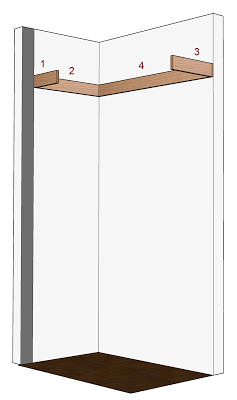 In the Lower Cabinet Top there are 3 pocket holes on the side to attach to the main divider. In the Lower Cabinet Side there are 6 pocket holes. 3 on the top to attach to the Lower Cabinet Top, and 3 on the bottom to attach to the floor. You can also use an L-Bracket to attach the side to the floor instead. After you drill the pocket holes, attach using the appropriate pocket screws as shown below. Position the assembled Lower Cabinet over the Lower Support as shown. You'll need to cut a notch on the bottom of the Lower Cabinet Side to fit around your baseboards. 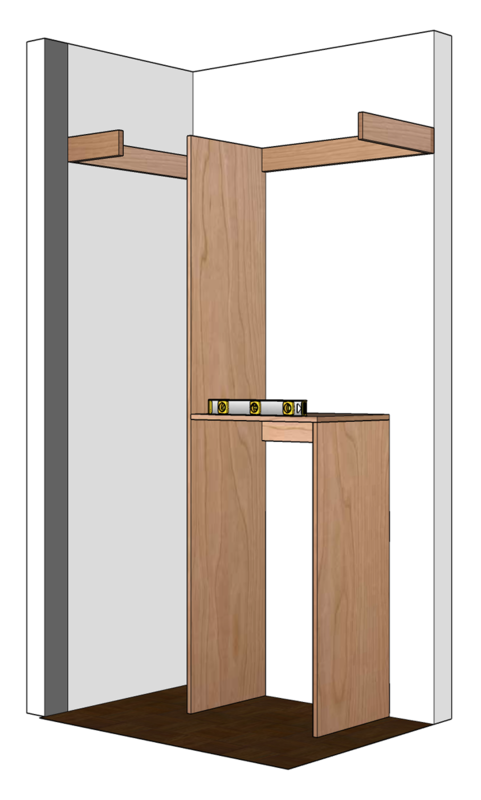 Make sure it's level and plumb all around and secure it to the Main Divider using pocket screws, to the Lower Support from the top and side using 1-1/2" wood screws that are countersunk (drill pilot holes to avoid splitting), and finally to the floor using pocket screws or L brackets. Check to make sure the Top Shelf fits properly. Trim it to size if necessary then place it so it rests on the top supports. Screw it in place using 1-1/2" wood screws that are predrilled and countersunk. Screw it down into the top supports as well as the top of the Main Divider. Mount the Closet Rod Flanges, cut the pole to size using a hacksaw and mount them as shown. 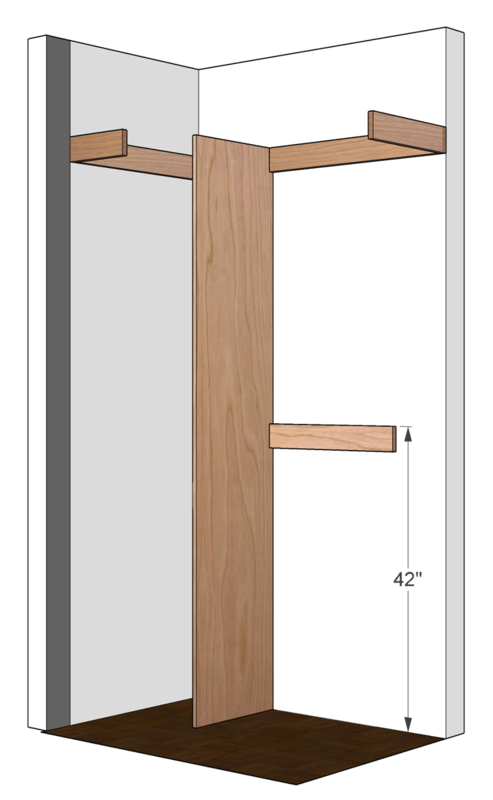 The closet rods should be installed so that the top-center of the closet rod is 12" away from the back wall (not the back support) and 1-1/2" down from the shelf above it. Mark out level lines on the walls where the shelves will be installed. 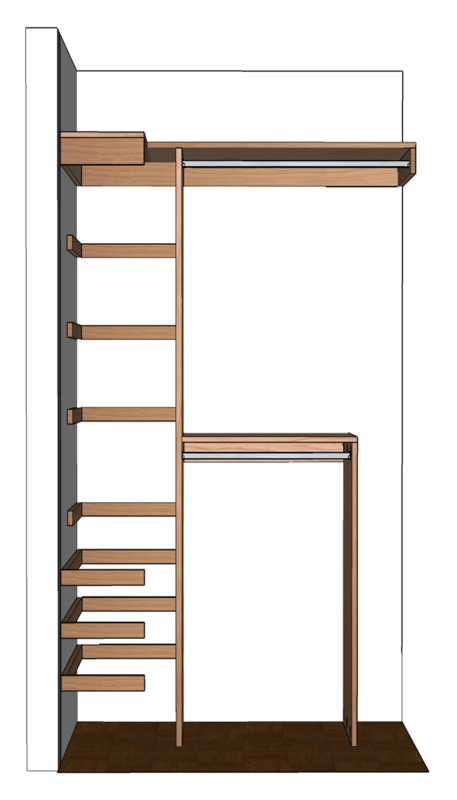 You can space the shelves whichever way works for you. 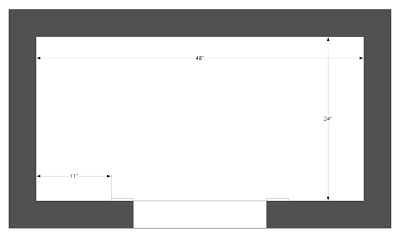 A good starting point is about 12" spacing for sweater shelves and about 7" spacing for shoe shelves. Use 3-1/2" wood screws driven into studs to install 2" strips of plywood (or 1x2 or 1x3 boards) at the marked lines to support the shelves as shown. Place the shelves on the shelve supports. Trim to size if necessary. Attach the shelves to the shelf supports by screwing down from the top with 1-1/2" wood screws that are pre-drilled and countersunk. On the side where the shelf meets the divider attach the shelf to the divider using pocket hole screws as shown. 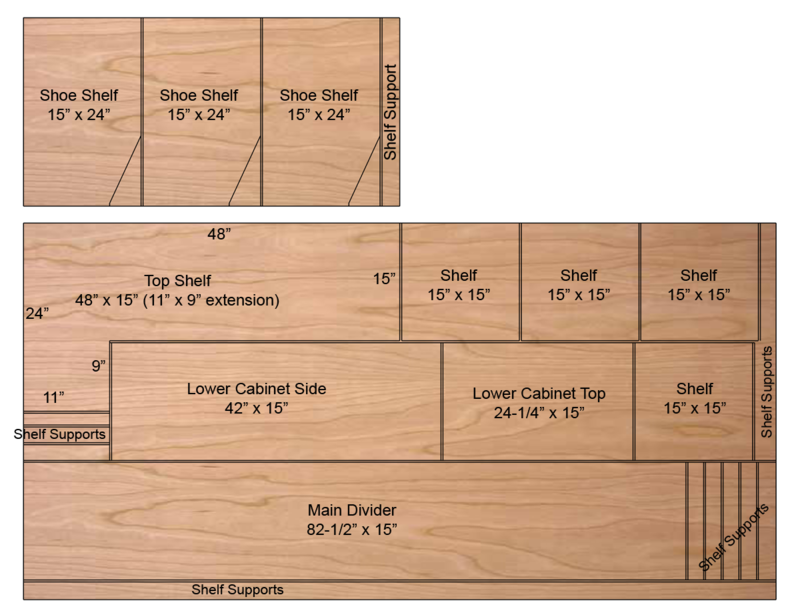 For the lower shoe shelves that extend to the front wall, you'll need to mark and cut out an angle from the cabinet to behind the door molding. Your closet organizer is now complete and ready for your clothes. You have finished reading DIY Small Closet Organizer Plans and many articles about Tech Gallery in our blog this, please read it. 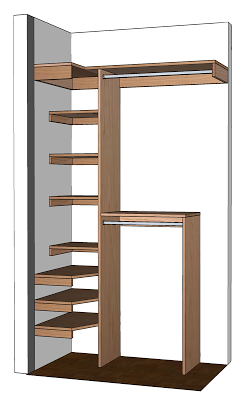 and url link of this article is https://littlebitjohnny.blogspot.com/2013/01/diy-small-closet-organizer-plans.html Hopefully discussion articles on provide more knowledge about the world of new tech gadgets.